Home Culture	Why can’t you eat chicken with pasta? The other day, I got to thinking about this prohibition. I have eaten pasta with chicken in the USA and must say that I didn’t enjoy it. But that’s probably because, like the rest of the Italian nation, I am programmed to dislike it, like cappuccino after 11am. For most Italian cooking rules there is a reason—the cappuccino rule is connected with your digestive health—so what is the chicken with pasta problem? Pasta on the side? Guaranteed to upset Italians. An extensive Internet and book search yielded nothing. There was no reason apart from, ‘because you don’t’. The closest I came to a reason was, ‘because pasta is not a side dish’. This seemed to be based on the idea that the writer couldn’t even conceive of a sauce made with chicken, and so people eating pasta with chicken had to be using it as an accompaniment. This is something I remember being horrified to see when I lived in France. I then decided to ask people directly. I spent a couple of weeks bringing it up with everybody I met: friends, acquaintances, even a group of lovely strangers I met in a street food restaurant in Rome. Chicken lasagne? Don’t tell my nonna! Because, if you are using pasta all’uovo, it’s mixing chicken with egg. This doesn’t seem right. Because pasta is served with meat that you cook for a long time, like beef, lamb, and so on. I don’t know, but it seems strange when you think about it because in Tuscany we eat papparedelle all’anatra (with duck sauce). I don’t know but it seems strange because we have no problems going to a Chinese restaurant and eating chicken with noodles, so it can’t be because it’s really disgusting. Just as I was about to put this article to bed, my friend, award-winning chef and food writer Amy Riolo sent me an email with a traditional recipe she’d found from Abruzzo. What was it, I hear you ask? Gnocchi con sugo di gallina. Yes, gnocchi with chicken sauce! It seems that the region of Abruzzo didn’t get the memo. I haven’t tried it yet. Something just won’t let me. But when I do, I’ll let you know. You might have a long wait though. As with a lot of things, there is no reason why you shouldn’t eat chicken with pasta. Just as there is no reason why you shouldn’t eat pineapple on pizza if that’s what you really want. Italians (on the whole) just don’t. (You can also find several recipes for it in Italian if you google ‘pasta pollo’ so somebody’s eating eat even outside Abruzzo.) I’m not here to judge, I’ll leave that to the ‘inhabitants’ of Italians Mad at Food and their nonne. Have you encountered an Italian ‘Mad at Food’? What do you think of this ‘rule’? I’d love to hear your comments. Luca, is there any similar prohibition against pasta with seafood? I know scampi is a big thing in the States, and during my time in Italy, I remember eating a marvelous risotto with mussels, clams, and shrimp, and in Venice I enjoyed a marvelous dish of cuttlefish in ink with white polenta, but I can’t say I remember seeing any pasta dishes with seafood. Pasta with seafood is fine. There are some amazing traditional dishes such spaghetti alle vongole (clams). 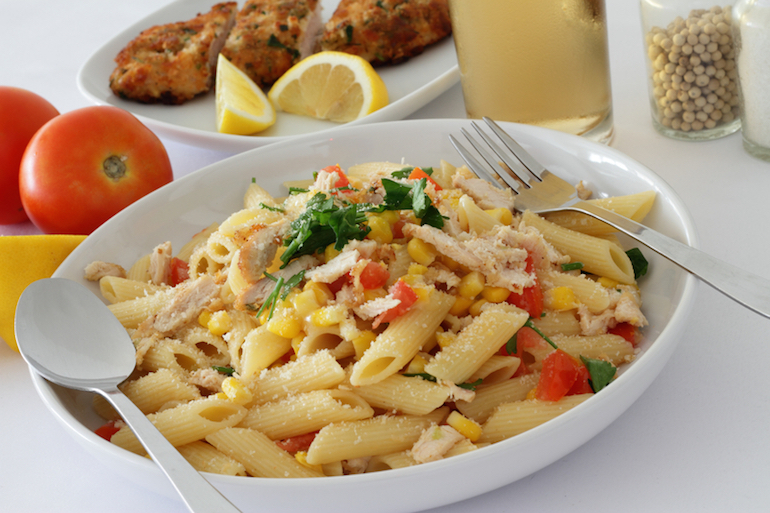 The shellfish based prohibition is to put parmesan cheese on seafood pasta. Love this post! It’s things that we just dont think about! Thanks! Italian cuisine is full of these little rules. Fascinating, isn’t it?